TRENTON – High school students participating in the Upward Bound program at Mercer County Community College’s James Kerney Campus had a lot to celebrate during the program’s annual closing ceremonies, where a capacity crowd in Kerney Hall honored outstanding academic achievement and promotions to the next grade level, as well as saying farewell to graduating seniors. 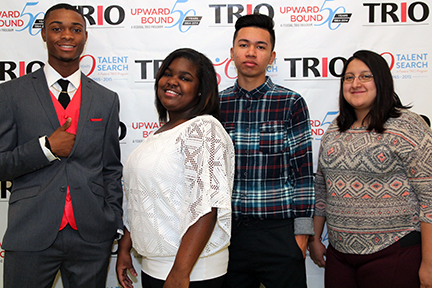 Upward Bound, an educational program for high school students from low-income families, strives to increase high school graduation rates and entry into college through the development of academic and personal skills. This year during the junior/senior tribute at the Upward Bound ceremony Raven White, the Upward Bound Ambassador president and current junior, presented the senior class with a pictorial representation of the colleges and universities they will be attending in the fall. Larry Taylor, senior class representative, accepted the memento with words of thanks and encouragement for the students who will return next year. “I leave you today with a challenge to thrive, be successful, and work at trailblazing a new world so that others coming up will be inspired,” Taylor said. Keynote speaker De’Andre Allen, an Upward Bound alumnus, shared his own life experiences that included substantial challenges, including the transition from high school to college. He encouraged students to embrace things that may seem unfamiliar, emphasizing that it is the path to personal growth. Among the 27 seniors honored were Camille Echols and Courtney Boone, who received The College of New Jersey (TCNJ) Promise Award. The award covers the full cost of the first two years of tuition, housing, meals, books and health insurance at TCNJ. Meshaylah Blue received the Tuchman Foundation Scholarship at Seton Hall University, which bridges the gap between grants and overall expenses. Other students honored during the ceremony include Mayada Farrah, Taisha Mayorga, Ashley Leon-Vanes, Bianca Randolph, Barrington Scott, Aluxus Brown Jason DeLeon, De’Asia Jones, and Quadir Sherman. 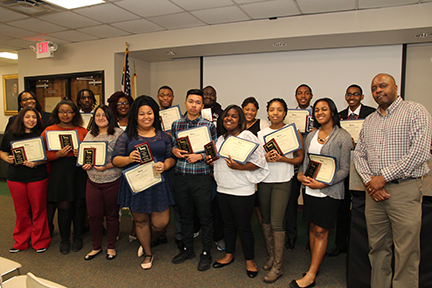 Congratulations to the Upward Bound student graduates! 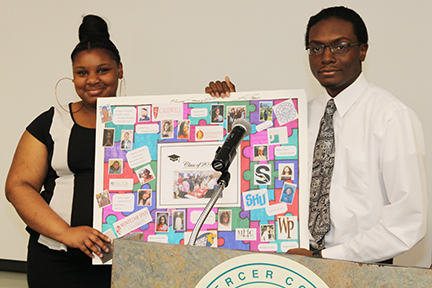 Raven White, the Upward Bound Ambassador President, presents Larry Taylor, Upward Bound senior class representative, with a pictorial representation of the colleges and universities Upward Bound students will be attending in the fall.